Details at the end of this post on how to win a copy of The Long Way to a Small, Angry Planet and links to purchase it. 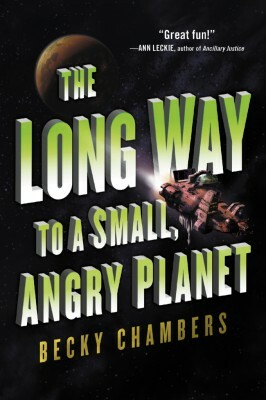 Take the episodic style of Twain’s Huckleberry Finn, add the close quarters of Alfred Hitchcock’s Lifeboat, throw in pirates and politicians, and set it out in a not-always-friendly galaxy, and you have Becky Chambers’ The Long Way to a Small, Angry Planet. The Wayfarer is a tunneling ship, digging wormholes in the universe to link planets. Captain Ashby is a patient man in the Scott Bakula mold, not always organized, but with a good heart, which belongs—in a forbidden love—to a freighter captain who travels in dangerous territory. He’s a pacifist, as a reaction to human history. His pilot is a reptilian with feathers, whose culture takes “touchy-feely” to new heights, so she has to hold back in her crew interactions. She doesn’t hold back her hatred of the algaeist who keeps the engines running, but nobody likes him, anyway. The cook/doctor with multiple hand-feet is mellow to the max. The mechanical tech is a good-hearted gal with a wild wardrobe and a fondness for fire shrimp, while the computer tech loves the ship—especially the AI that keeps everything running. The navigator is a paired organism whose virus helps him see space in mathematical terms…and is slowly killing him. Throw into this mixture Rosemary, a clerk hired to do the work Ashby always puts off. She takes the job to prove her worth, to boldly go where she’s never been before, to use the education she just finished, and to escape her past. Chambers takes this crew the long way around the galaxy to get to a high-paying job in a region nobody wants to go to because the inhabitants are just too strange—and this in a galaxy with blobbish plutocrats and bird-pirates in mechanical suits. The aliens are unusual, the sexuality is different, and the journey is eventful. Speculative fiction is often concerned with world-building, but this book is more about shipbuilding and character-building. Sometimes the solutions to the problems are on the order of of-course-I-can-communicate-with-these-aliens-because-I-took-a-semester-of-another-language, but the surprises are pleasant, and this long, strange trip has laughter and tears. The Long Way to a Small, Angry Planet is apparently the first book in a series. When the next one comes out, I’ll be ready to go for another cruise on the Wayfarer. 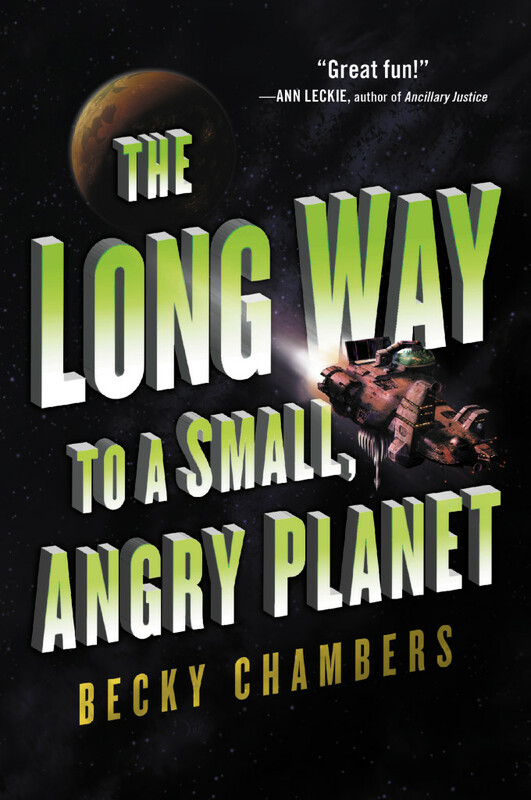 To enter to win a copy of The Long Way to a Small, Angry Planet, simply email KRL at krlcontests@gmail[dot]com by replacing the [dot] with a period, and with the subject line “planet,” or comment on this article. A winner will be chosen August 27, 2016. U.S. residents only. If entering via email please include your mailing address. Check out more fantasy/sci-fi book reviews in our fantasy and fangs section. This sounds like quite an intriguing crew! I’d be interested to see what they get up to. This sounds like a really interesting read. Thanks for the chance to win.